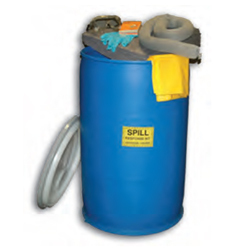 Spilldam, Inc., offers a wide selection of oil and liquid absorbent products such as booms, pillows, pads, rolls, socks and sweeps. We are constantly evaluating the cost and benefits of the latest technologies including, polypropylene, cellulose, cork, peat, and polymer based absorbents. We are dedicated to offering a variety of absorbent products in an effort that every customer can receive the most economical and efficient product to suit their needs. Response time is crucial when it comes to cleaning a fuel or oil spill on or near water. The faster you respond, the easier it is to minimize damage to the environment and avoid costly fines. This kit provides you with almost everything you need to become an efficient first responder. Versatile absorbent pads are available in a variety of sizes and thickness. Quickly deployed and easily recovered, they are ideal for any oil spill, small or large. Adsorbent rolls can be swiftly deployed over large areas of land or water and trimmed to fit specific spaces. Adsorbent booms are designed to be linked into barriers of any length for containment and absorption. They are easily deployed and towed, and different sizes are available for a variety of marine and industrial applications. With its built-in straps, the adsorbent sweep can be drawn over the water surface to absorb broad sheens or surface spills. Universal “no-lint” dimpled pads and rolls are designed for aggressive and non-aggressive chemical spills. These lightweight adsorbent pads are the perfect choice for smaller spills. Static-resistant adsorbents should be deployed around flammable liquids and where static electricity poses a hazard. They are suitable for use in both arctic and desert climates.